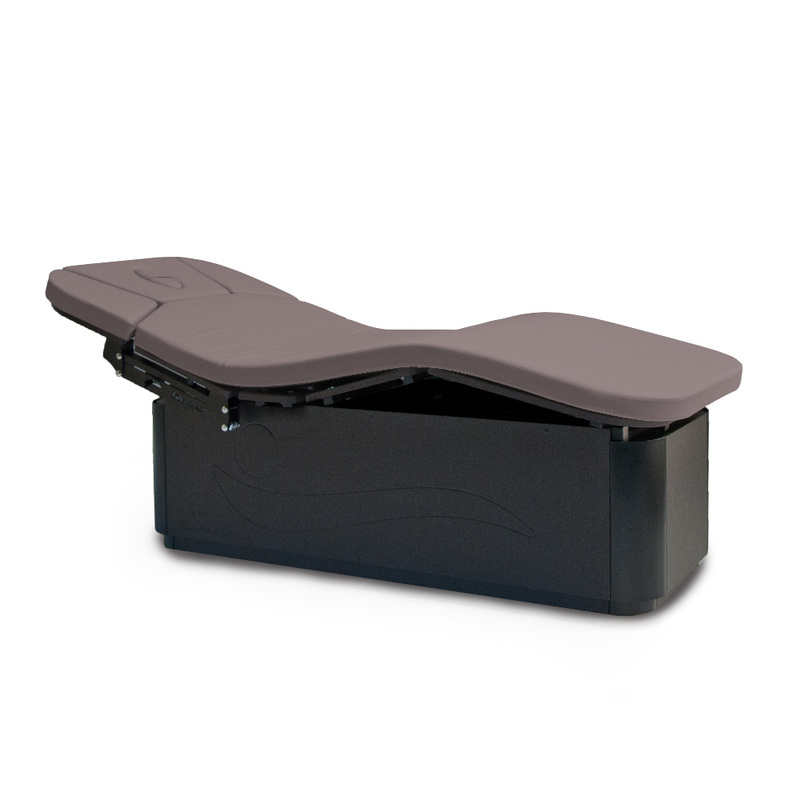 The MLX Limber offers you unlimited and perfect flexibility! 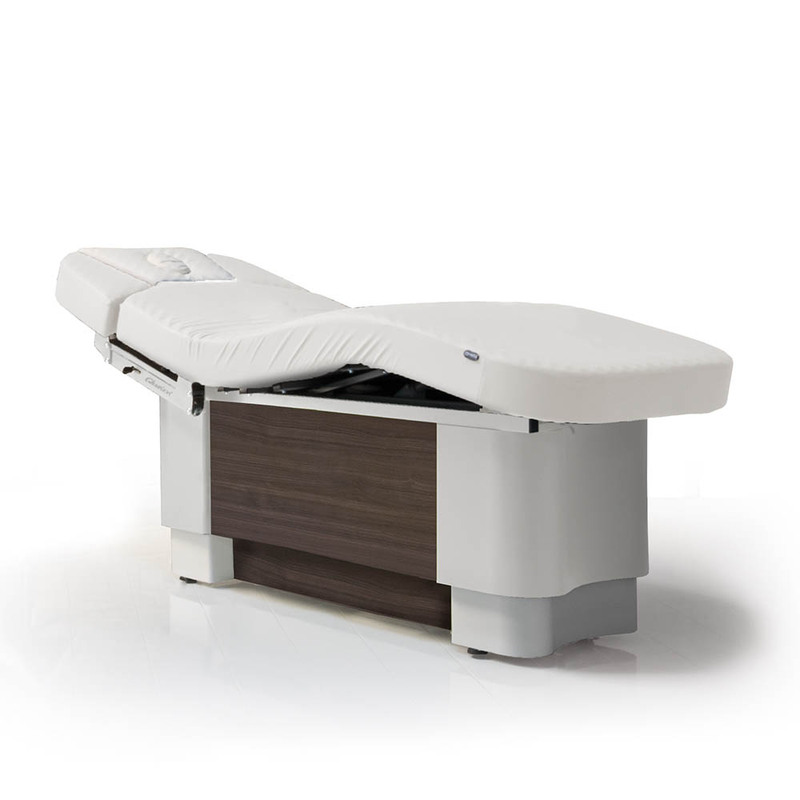 Our new massage and wellness table enables treatment positions that are unique and exceptional in their variety for bed positioning without limitations! 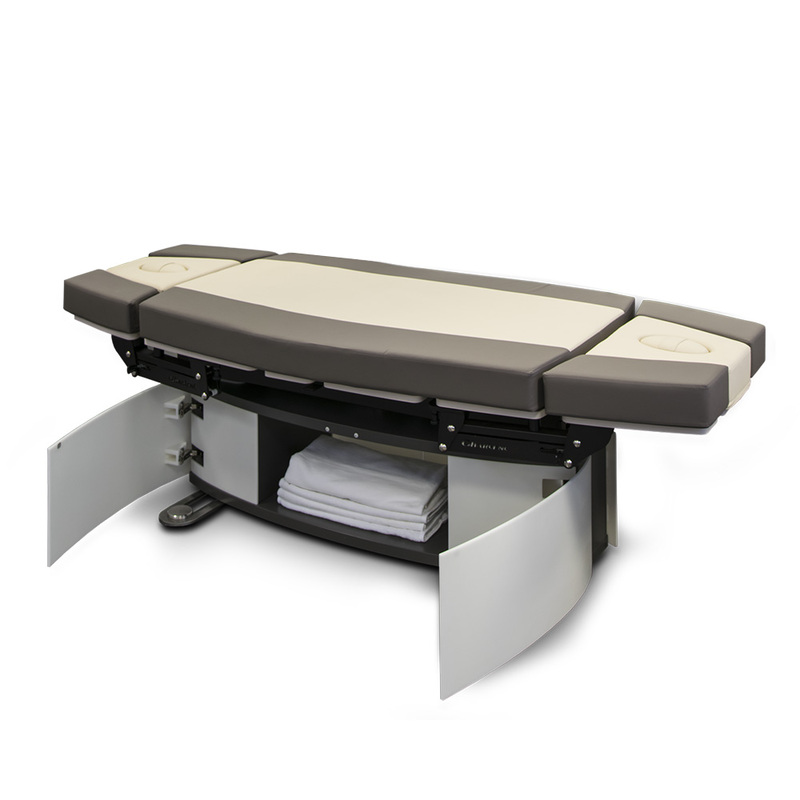 With the MLX-Limber series, Gharieni introduces the next generation of spa tables. 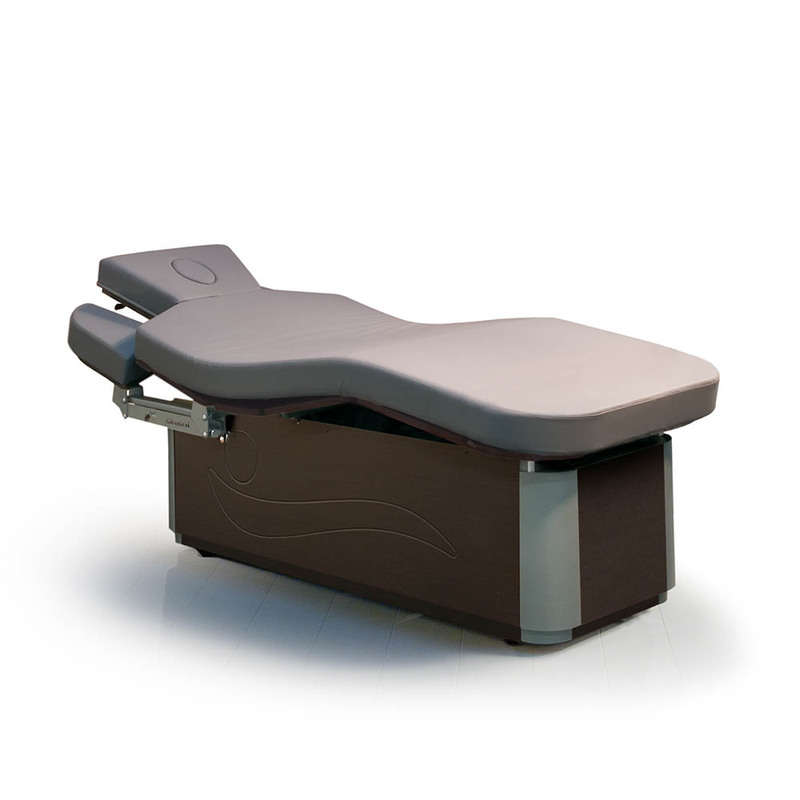 Its amazing flexibility offers a variety of positions including sitting, half or head-down (Trendelenburg) to meet all your treatment needs. 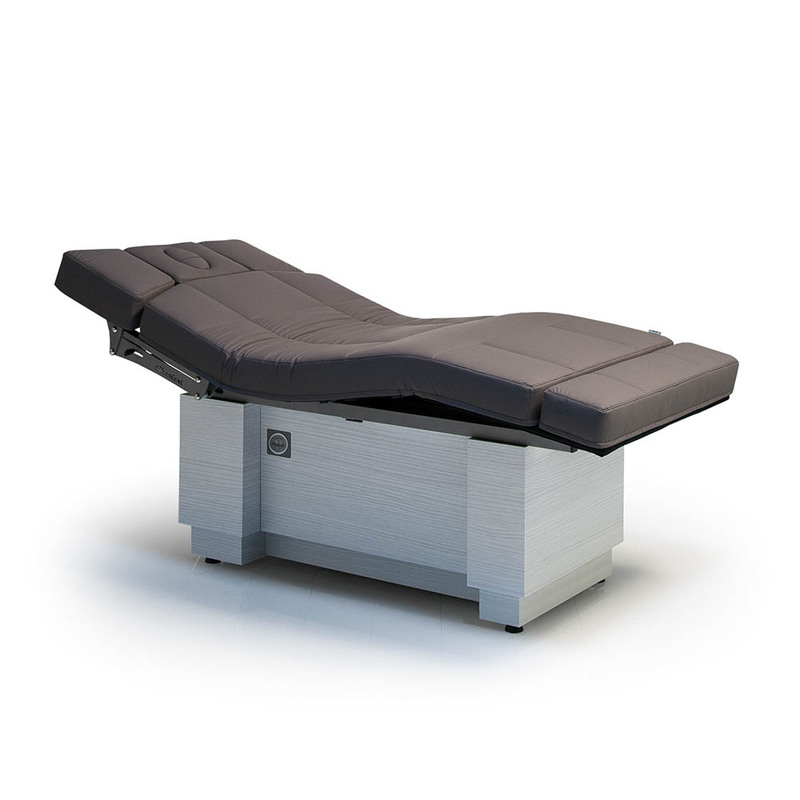 Adaptability for standard massage treatment to more enhanced or specialized treatments, the “Limber Flex” offers an infinite number of adjustment options as well as a modified top position. 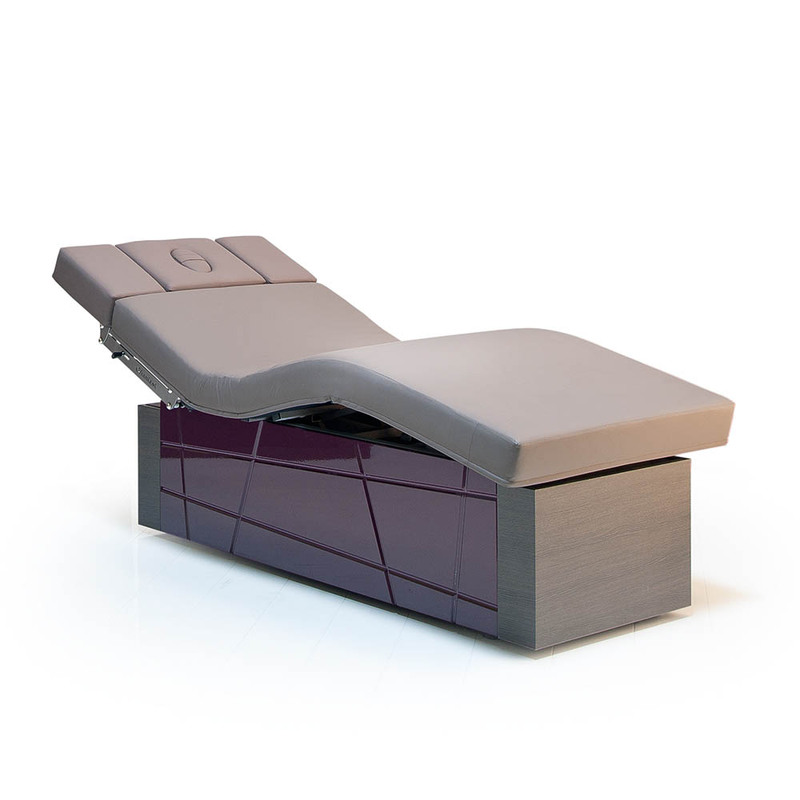 Our exclusive patented, double sided, lowerable pair of armrests has never been seen before and allows for usability of the MLX Limber on both ends, which makes it a truly multifunctional spa table with unequalled flexibility and offers new dimensions of treatment options. height: 63-100 cm (24.6-39.0 in) approx. length: 203 cm (79.2 in) approx. width: 85 cm (33.2 in) approx. 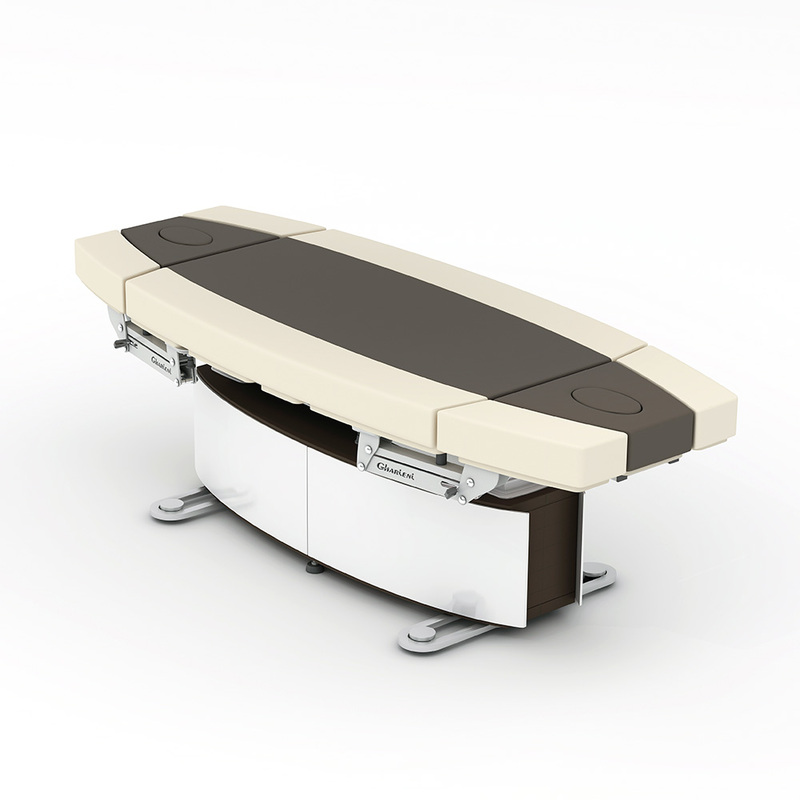 Exclusively designed table for the spa & wellness sector. 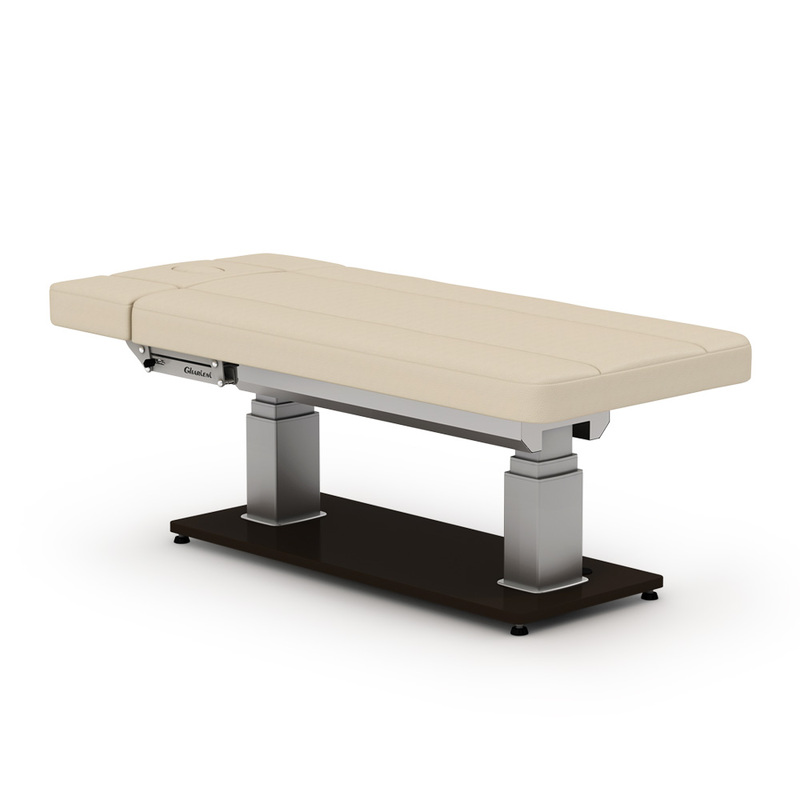 This multi-functional and fully adjustable treatment table encompasses all the best table features including removable arm rests, nose slot, incline positions, height adjustments, and large storage area. Made of durable PU upholstery or synthetic leather, it is also available in an array of colours, cushioning thicknesses and finishes. The MLR Select is the further development of the MLR Classic and, unlike its predecessor, has lowerable and swivelling armrests. 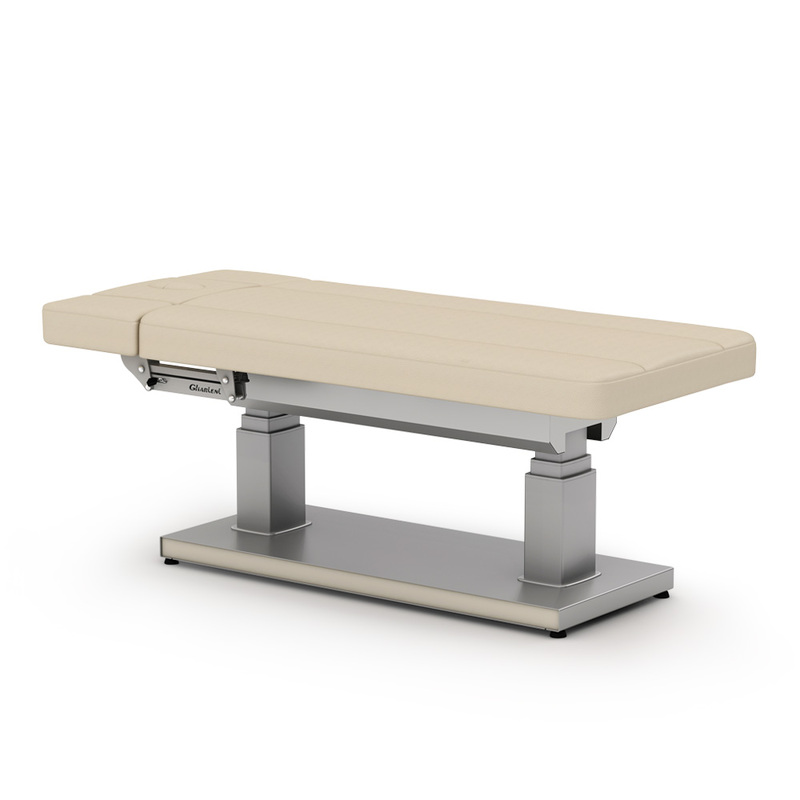 The spa table is available in three different versions: Alu, Wood and Static. 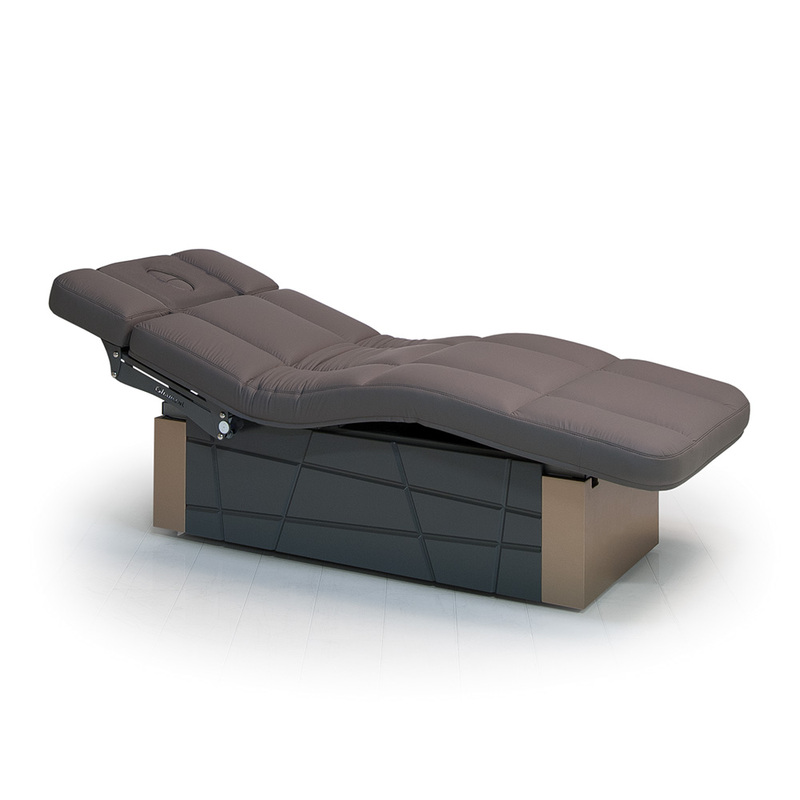 The elegant and simple design provides optimum space for the therapists` legs. 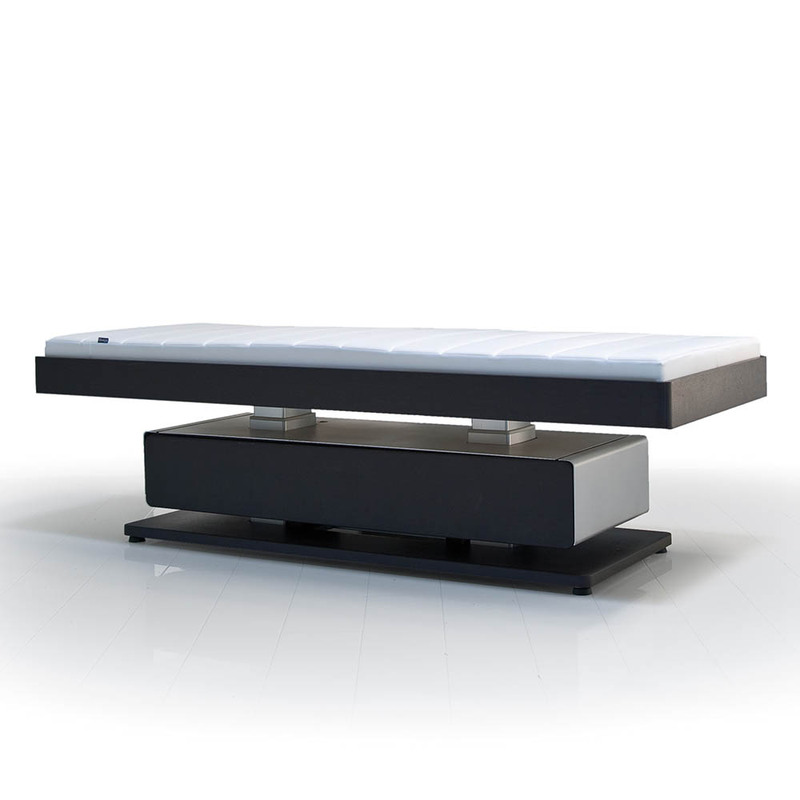 Two strong lifting columns allow the height adjustment and the inclination of the bed. 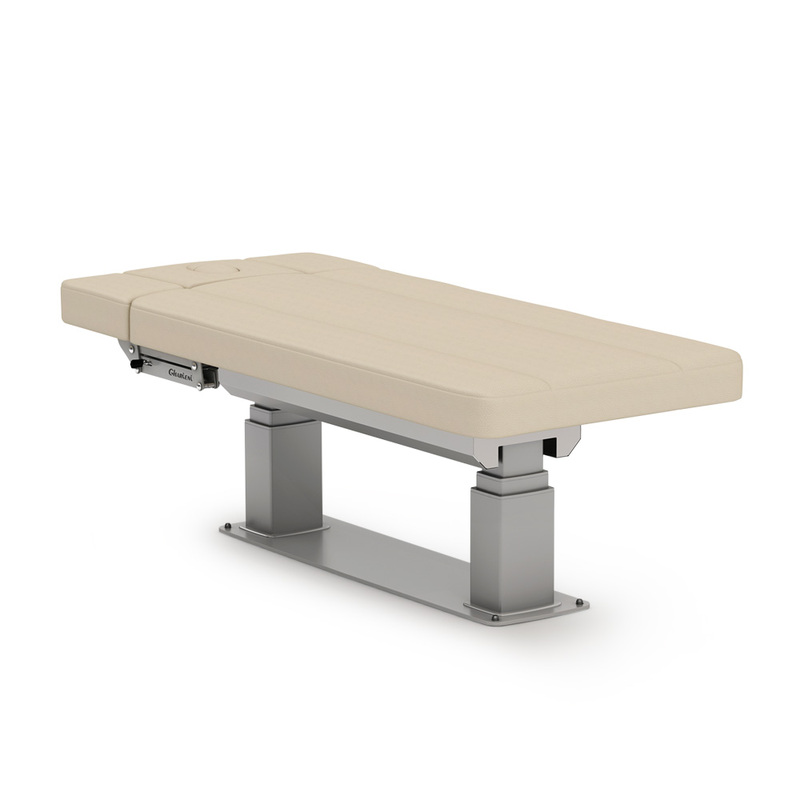 The lowerable armrests as well as the adjustable head, back, leg and foot sections make the MLR Select a versatile spa table. 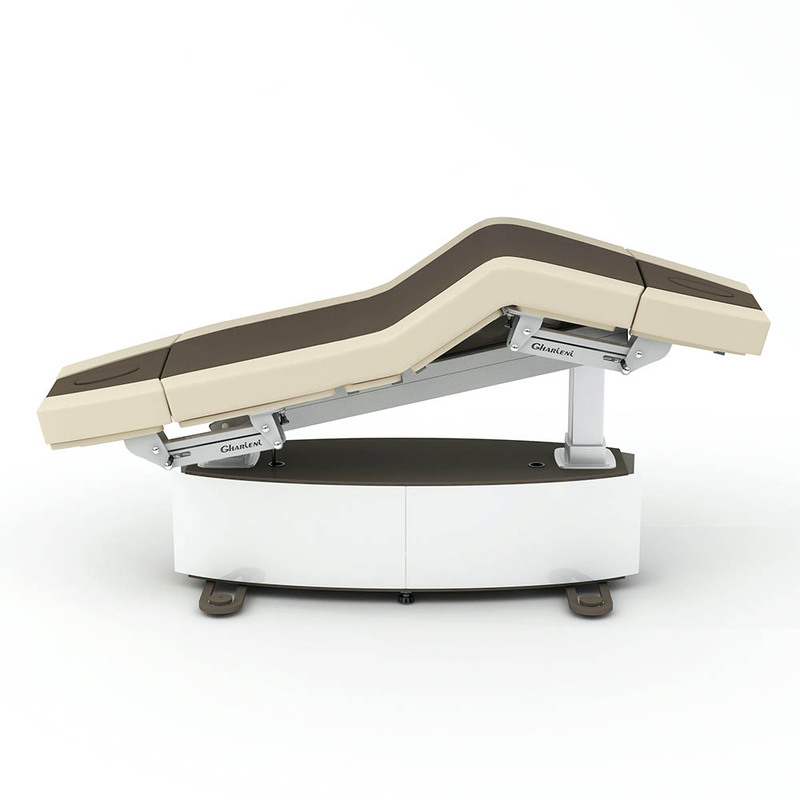 As an option, the bed can also be equipped with the integrated Smart-Thermo heating system and other features. 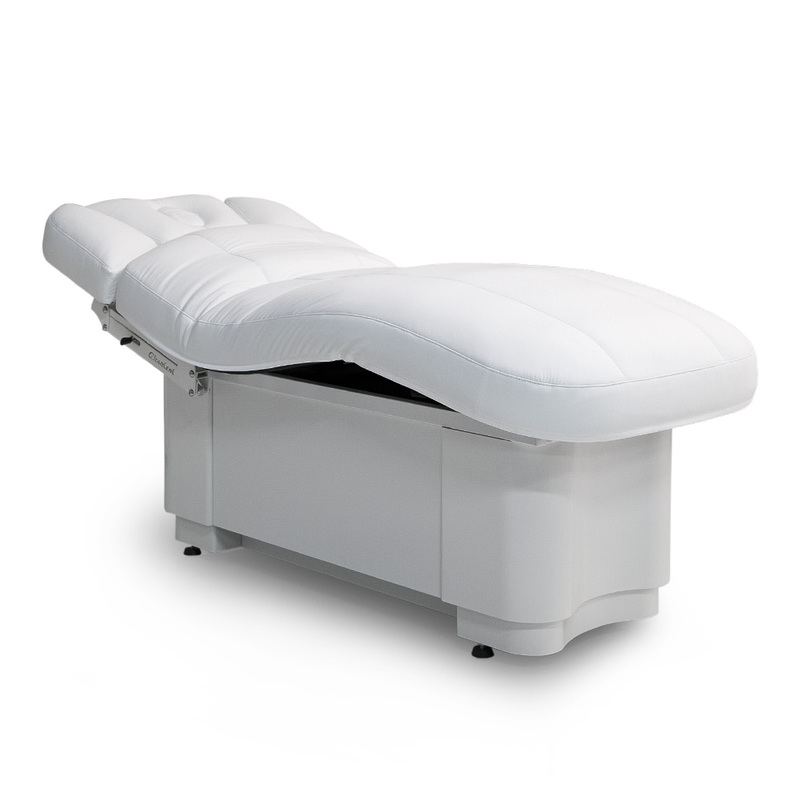 The MLR treatment table is standard yet offers multi functionality for spas looking for a dual purpose table with features including, nose slot, incline positions, height adjustments, all electronically adjustable. Made of soft PU upholstery or synthetic leather, it is also available in an array of colours, cushioning and finishes. The MO1 Evo astounds with an extremely low accessibility of under 50 cm (19.7 in). Adjustable and swiveling armrests are valued for their extreme comfort. The storage space in the base is flexible and configurable and can accomodate Hot / cool cabis either at the head and / or feet ends. It is available in many different decors and fully customizable to any décor. 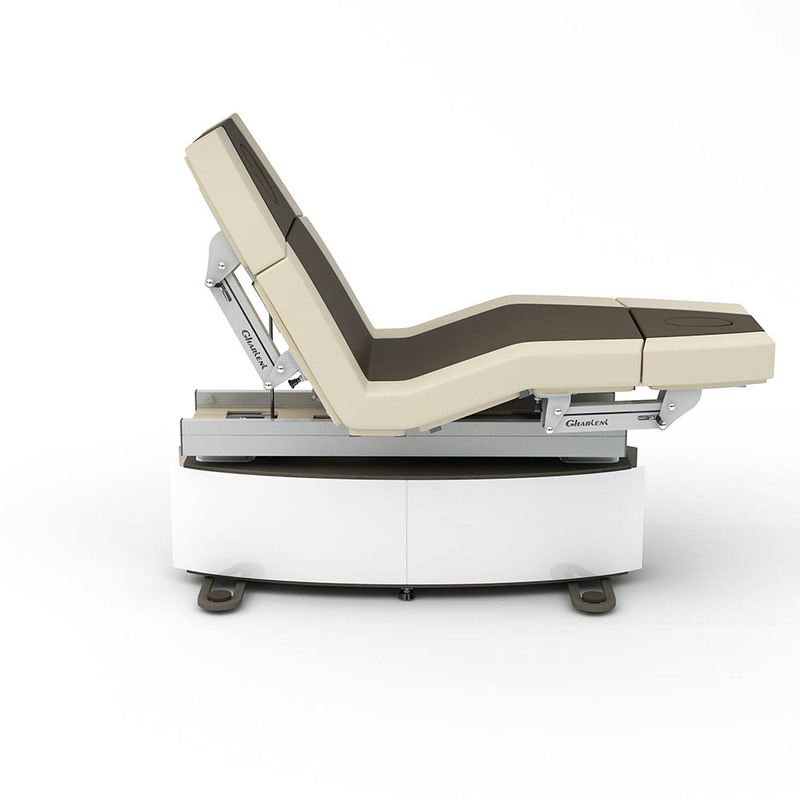 Sofa and treatment table combined. 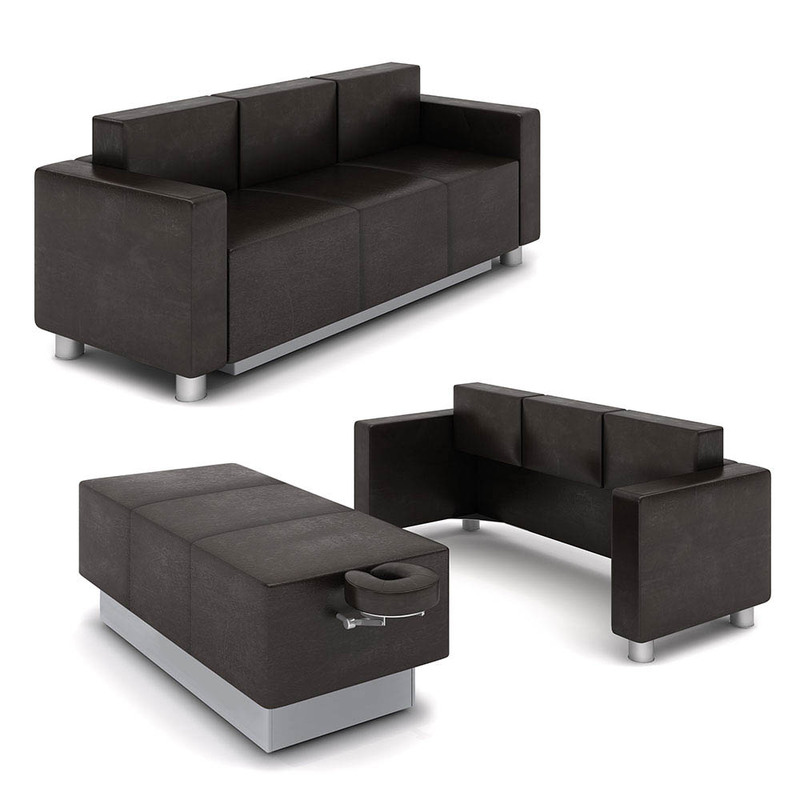 The Gharieni MLW Transform is a sofa which transforms any living room or other area into a treatment room. It easily detaches and rolls from the frame and includes features such as electronic height adjustment, detachable cradle, power connection, rechargeable battery, and a heatable surface. Made with durable leather like upholstery, it can be customized with any fabric to customer specifications, including leather. Back sofa cushions are also detachable. height: 80cm (31,2 in) approx. depth: 87 cm (33,9 in) approx. width: 212 cm (82,7 in) approx. height: 45-75 cm (17,6-29,3 in) approx. length without face cradle: 166 cm (64,7 in) approx. width: 75 cm (29,3 in) approx. With a large storage space in the base, the new MLW Space offers flexible space for two hot cabis, storage for towels and blankets and much more. The client can guide the design process from the upholstery to the paneling to suit individual needs and according to overall design aesthetic. 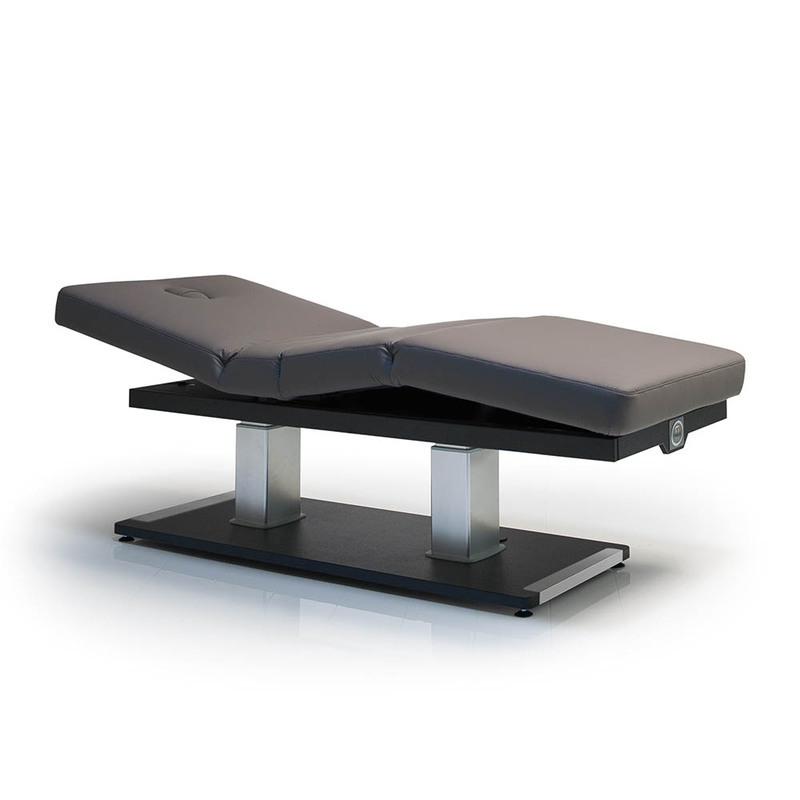 Access height ranges from 57 cm and can be increased to 92 cm high to adapt to all therapists’ heights. The width of the lying surface ranges from small: 76 cm, to medium: 85 cm and even large: 92 cm. Cushion thickness is about 10 cm and the base is narrow at only 55 cm. 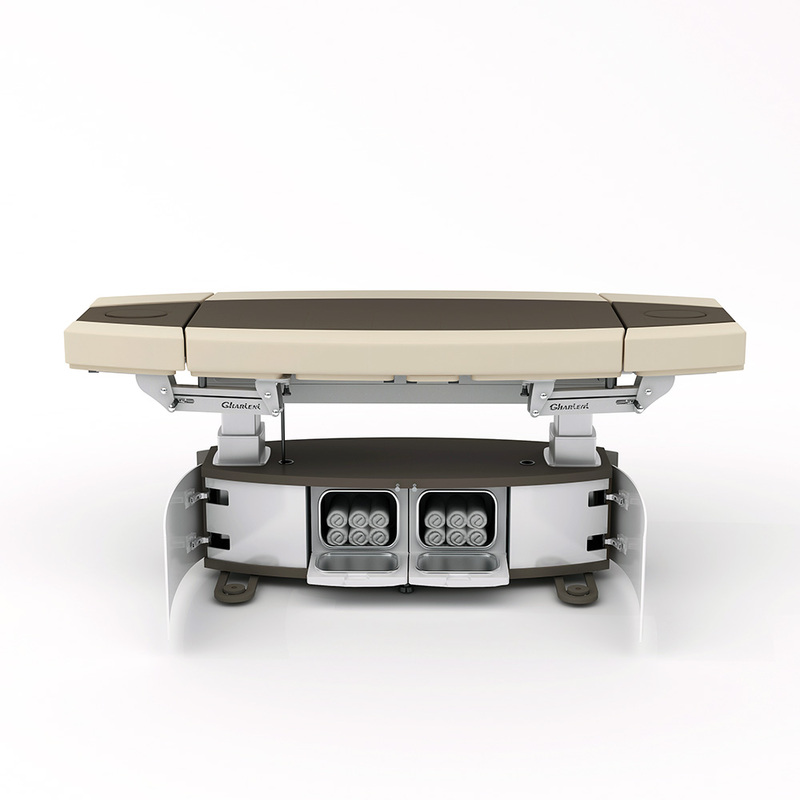 The armrests can be lowered laterally by Stabilus gas pressure springs. 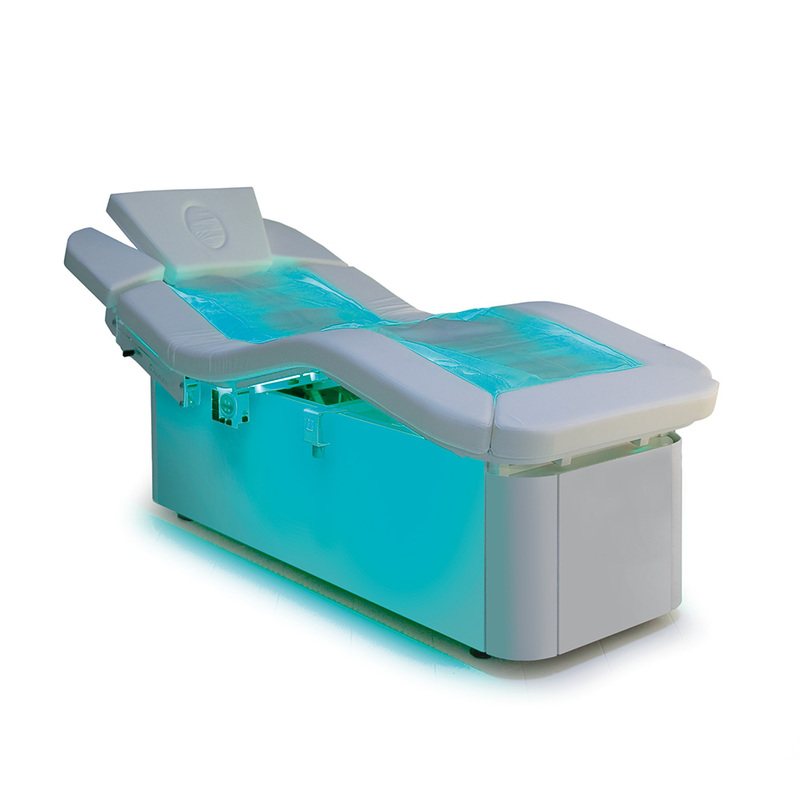 Used for both facial treatments or whole body treatments the MLW Amphibia is a multi purpose bed that can integrate either a water feature with the use of a waterbed pad or a traditional upholstery pad. 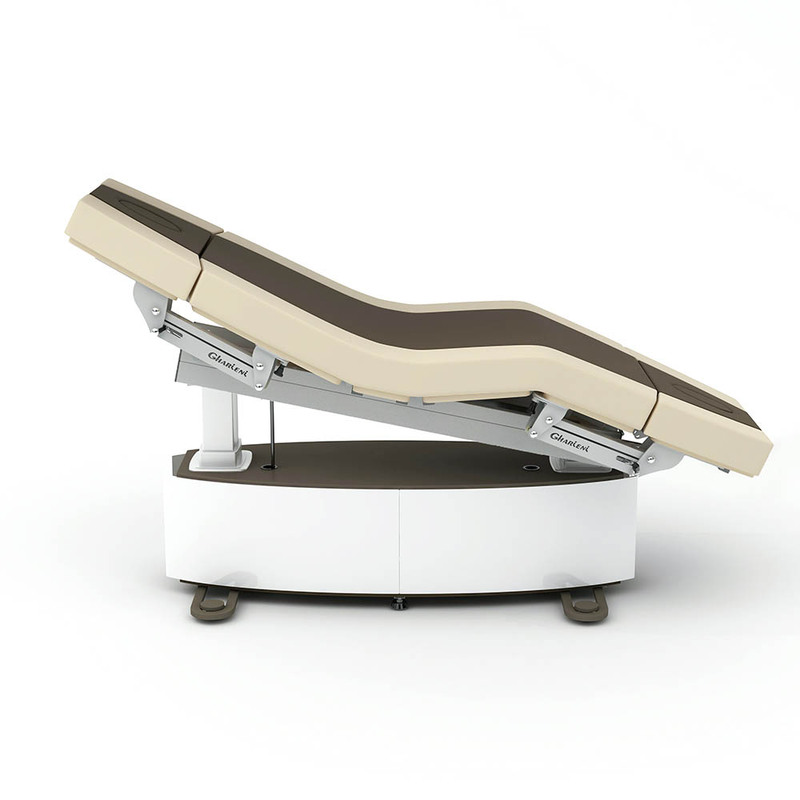 Enhancing the treatment experience with its illuminated pad option truly differentiates from a more typical treatment bed. The narrow base trim is the perfect solution for added leg room. With configurable equipment. 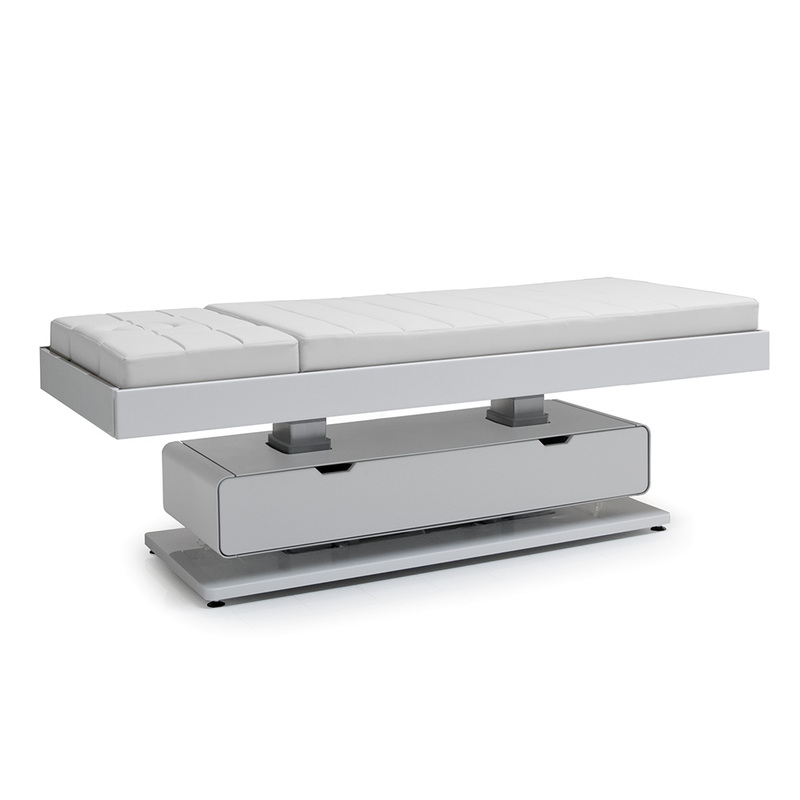 Height, inclination, backrest and footrest are electronically adjustable, the armrests can be lowered and swiveled pneumatically, the head part can be tilted +/- 30 °. 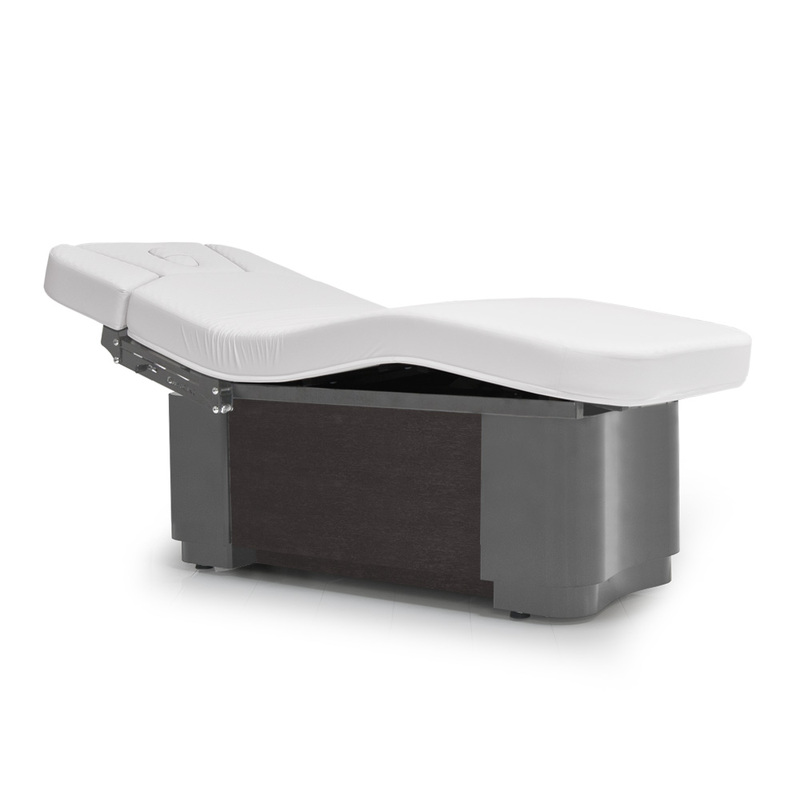 In order to optimally adapt our beds to your specific needs, we offer a wide range of accessories, such as covers, gel cushions or additional storage areas. 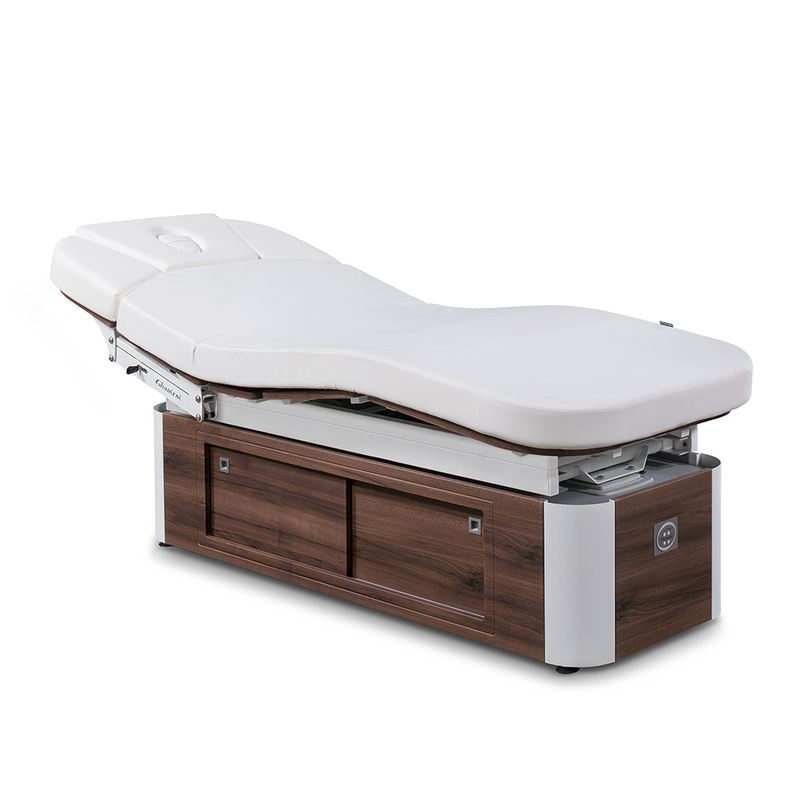 Customize your own treatment bed with our extensive selection of colours for upholstery and millwork to enhance your treatment rooms with our adaptable spa tables. For even more luxurious lying comfort, our extra soft upholstery offers restful, extra thick cushioning for the ultimate relaxation experience. 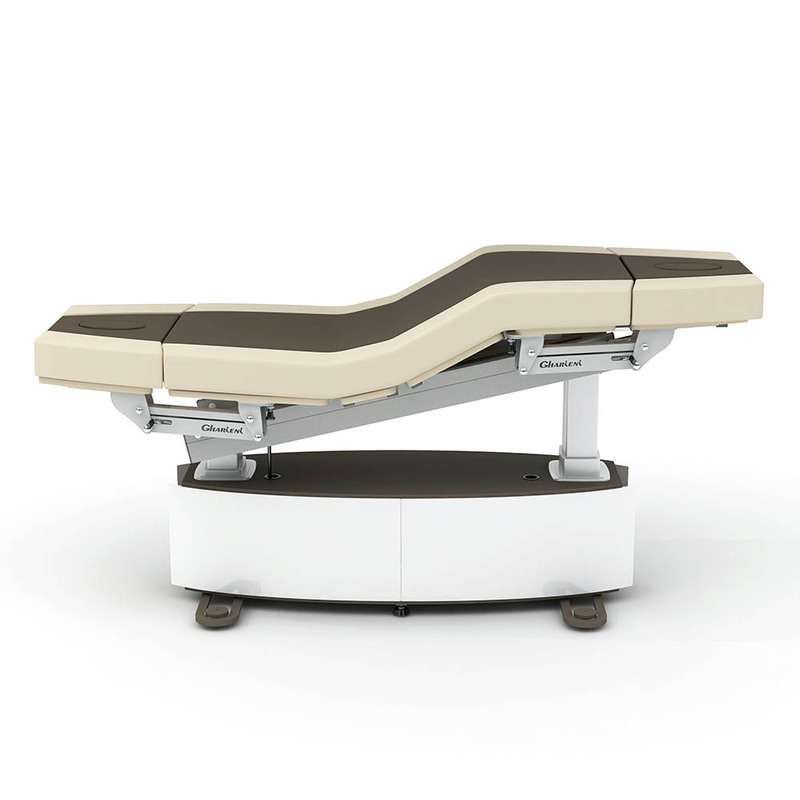 The Gharieni Group is the leading German manufacturer of high end spa tables, wellness, beauty and medical equipment with over 25 years of experience. Present in more than 100 countries around the globe, we collaborate with almost all of the leading corporate hotel companies. 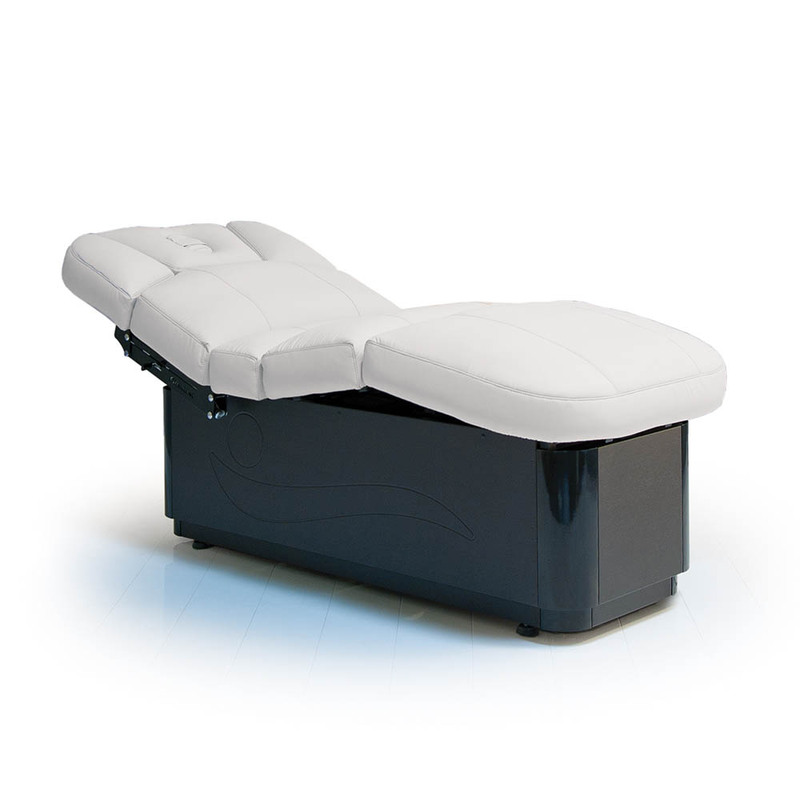 Our Spa division is proud to offer the ultimate in spa equipment solutions to our clientele with a wide range of spa tables, loungers and furniture.